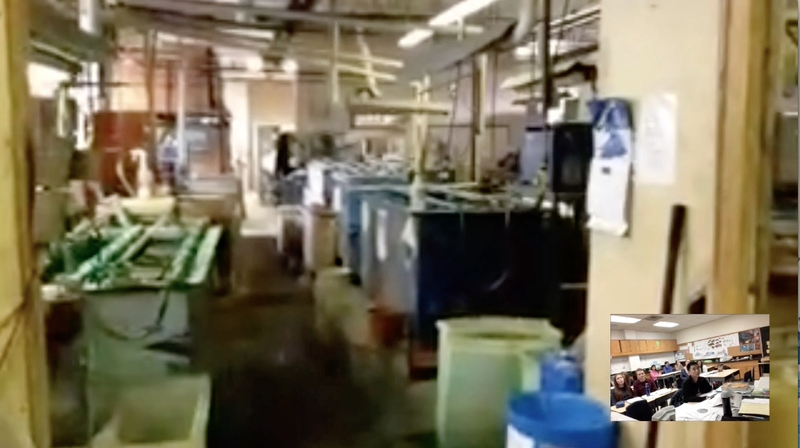 FaceTime + Class + Your Dad = Learning Electroplating! Grade 12 IB chemistry was pretty fun yesterday! We were learning about electroplating and thought why not try and text my dad and see if he is at work. My dad has been an electroplater his whole life and the head plater at his work. No sooner did we text him, we were FaceTiming from our phones and learning! I used AirServer to connect my phone to my MacBook so that the students could see and recorded the call in app with AirServer. The recording didn’t get us speaking but my dad came in loud and clear. He gave us a tour of the nickel, copper, silver and gold plating tanks. It fit in so perfect with my lesson and really shows chemistry in action. STEM education is important and you need to know a lot about chemistry to do this job. From choosing the proper electrodes, and solutions to getting the amount of volts and timing right, the students got to see live plating. Check out the video below of my Dad, Peter Zoras, showing my TDSB class how to do platting! I was asked to lead a demonstration classroom to 8 other teachers within my school board. I was nervous at first, as I knew I was going to be one of the newest and youngest teachers there (which turns out I was). I was also very excited to share some of the ideas I have tested and receive feedback. The session was called Incorporating Literacy & STSE to Engage Digital Learners. I firmly believe a great way to engage applied students in science is to pose a problem that is relevant to them. We started off by watching the trailer to the documentary called H2Oil (http://www.youtube.com/watch?v=xenYLY5lU58) , and then an ad from Cenovus Energy, a company wanting to extract oil from Alberta Oil Sands (http://www.youtube.com/watch?v=D1mZMOP-wbY) . I had the students write on an oil drop if they believed we should remove the oil from Alberta and sell it to other countries. The students had various opinions, and were given the option to change their opinion once they watched both trailers. 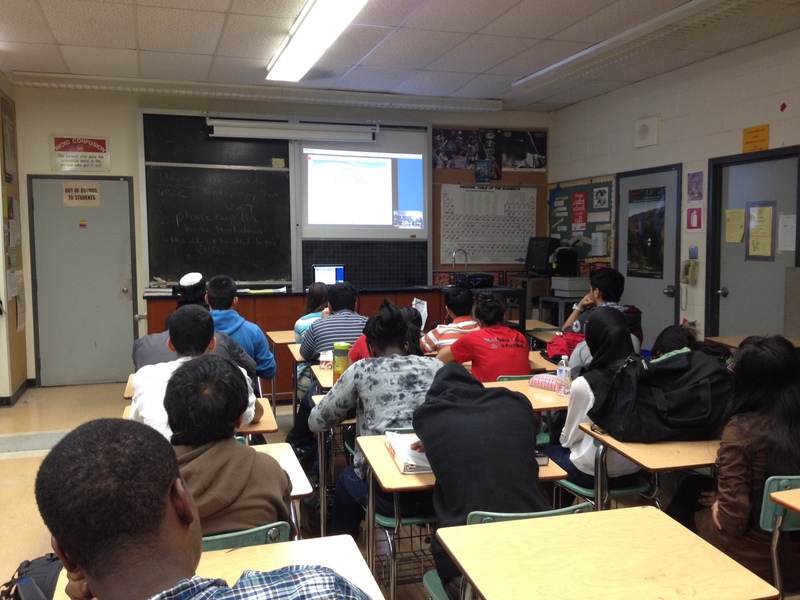 The following week we actually screened the full H2Oil documentary to the students. The other teachers came into the room and watched how the students used netbooks to create a wiki about power generation. The lesson plans will be placed below the post. The idea was a new island was formed in Lake Ontario that needed its own type of power generation. The students needed to make a wiki to make a pitch to the mayor to choose their best power generation (nuclear, coal, solar etc.). Students had time to research and then use Wikispaces to create the site that included diagrams, picture and YouTube videos. The teachers were very impressed with how seamlessly the technology was integrated into the lesson. That is how technology should be integrated, the curriculum and concepts are more important, technology is the tool used. We can grow our technology skills and transfer them to other areas as well. We ended with an Exit Card, which had the students write down 3 things they learned, 2 things they wanted to learn more about and 1 way they can make a change to help the environment. This allowed me to read them and see what they learned from the lesson and what I needed to add next time, as well as their interests. The debriefing of the demo class went very well, we worked together with the Instructional Leader for science to provide feedback and also how the other teachers could do this same lesson this year. I really enjoyed running the session and hope to do another soon. It is very important as a teacher to step out of your classroom and try a new project once and a while. The most important thing about technology that I have learned is that the students will always surprise you by doing something beyond or even helping you when you are stuck. This years conference was very successful and teaches us the importance to come together every once and a while and share. This is the 3rd one I have been to and first one I have presented at. There is always something for everyone from things as small as nano particles to as large as global warming and black holes. Alan Nursall (@alannursall) did an amazing job opening up the conference. 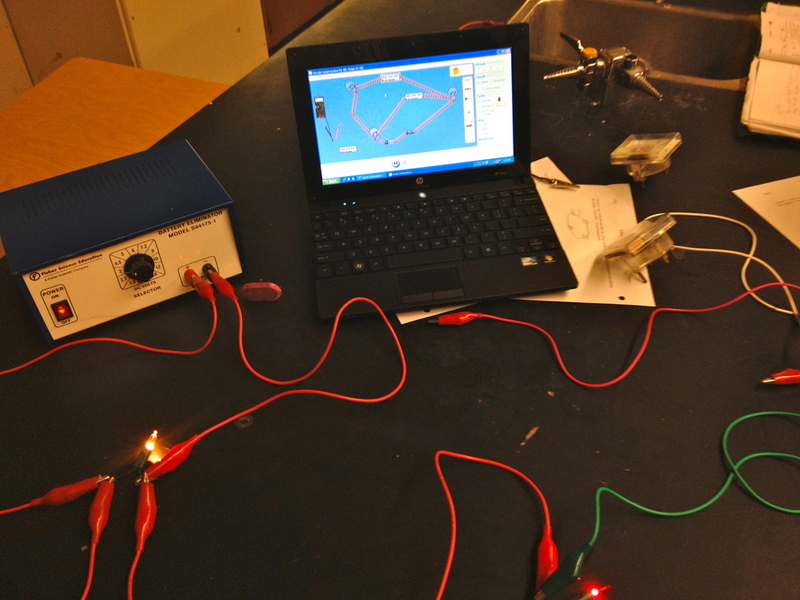 He engaged us with unique demos that got us all thinking of how to further open the minds of our students to science. He discussed the importance of shared learning and understanding science. This is modeled in his show on Daily Planet. My presentation “Not another boring brochure! 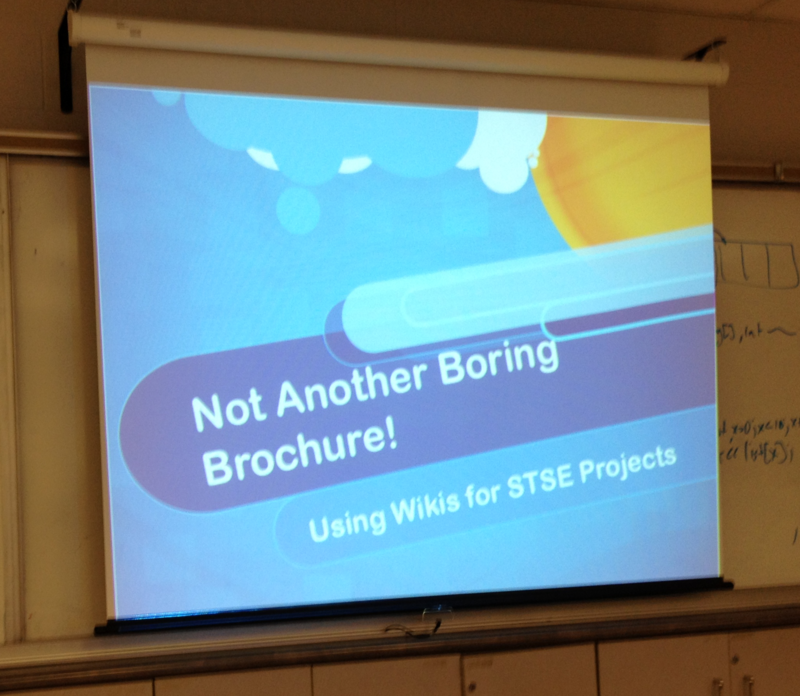 Using Wiki’s for STSE projects” went extremely well. 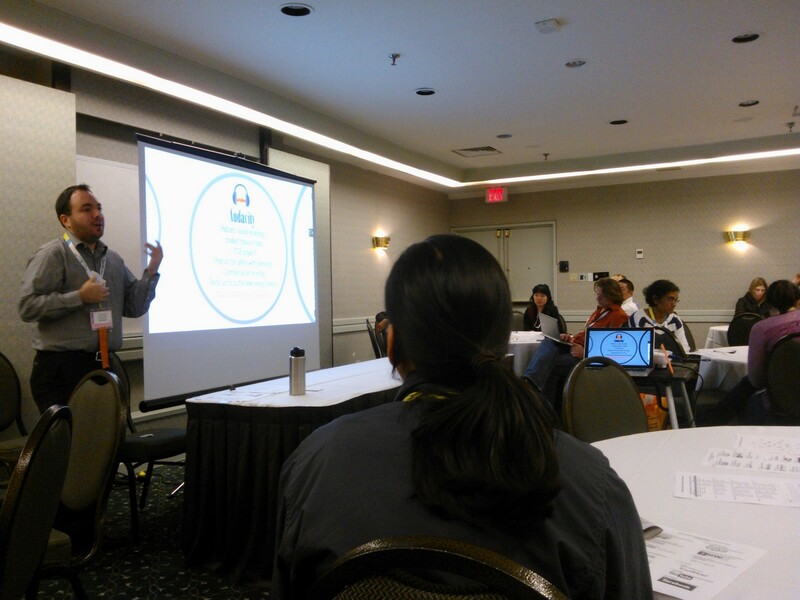 This was my first time presenting at a conference as I have hosted demo classrooms for groups no larger than 10 in my class. (See here for the wiki we collaborated on and the handouts and power point notes http://mrzoras.wikispaces.com/). The most important part of my session was to have each teacher leave with a functioning wiki, a better understanding of using STSE education (Science, Technology, Society and Environment) and a list of their own wikis so we can collaborate in the future. I really enjoyed presenting and made me think that if someone has a good idea its best to share it as we have seen people who like to keep ideas to themselves. Within a public education board, we are all paid on a grid not on what lessons we produce. So why not help other teachers as I can only support my 90 students a semester and they shouldn’t be the only ones benefiting but if I help 35 teachers, do the math! We should all be collaborating, working on fluid projects that look at how to make ALL students successful. I attended two other sessions, one “Incorporating Literacy, STSE and Co‐operative Learning in Gr. 10 Science” by Leila Knetsch, who I have had the pleasure to work with before. She did a great job sharing and modeling a wide variety of hands on activities to explore STSE components. The other session was about a site with online lesson plans and virtual classrooms. http://www.greenlearning.ca/ is a site about climate change and science. The subsite Cool 2.0 allows for collaborative, rankings and submissions of lesson plans and activities. This is a great way to share resources that are approved and classroom ready. All in all, great conference and now with one conference complete I will be looking for ways to share at other events! 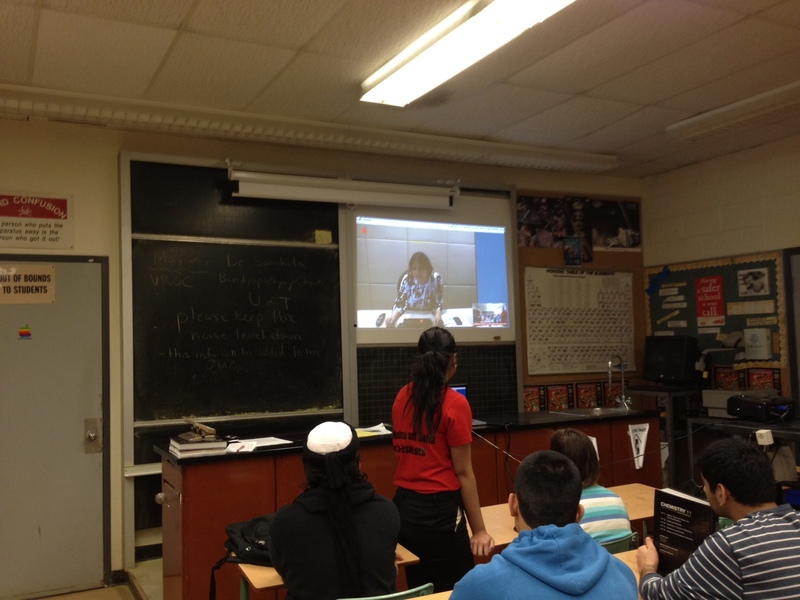 Thanks to Nandanee Sawh one of the instructional leaders of science from TDSB for organizing such a successful event.